By Marcin Radoslav, Kurcewski 2002. Sapphon may be accompanied by a Dark Angels Reclusium Command Squad as described in Codex Space Marines v 4.0. Sapphon commands great respect amongst the Dark Angels and as such all Dark Angels units within 12" of Sapphon and having a direct line of sight to him will automatically become "stubborn". 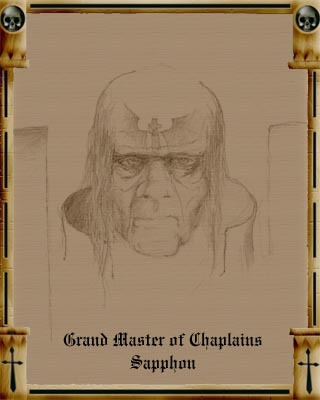 Grandmaster Sapphon is neither the oldest nor the most exerienced Interrogator Chaplain. He is both younger and less experienced in their ways thn Asmodai. His main reason for attaining his position was his superb inspirational leadership of men on the battlefield. A pict image of Grandmaster Sapphon at the of his ascension to the role of "Finder of Secrets"
Grand Master of Chaplains with the honorific title Finder of Secrets. Wargear: Wargear: Powersword, Crozius Arcanum, Blades of Reason, Boltpistol., Frag and Krak grenades. The point cost of wargear and armour saves are already included in his profile.